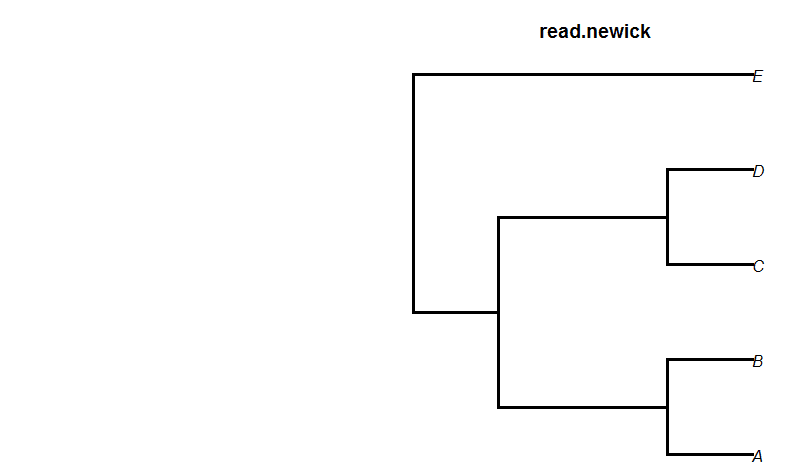 phytools has a function to read simple Newick format trees (called read.newick). This function has been totally useless because it is completely redundant with read.tree in the 'ape' package. However a recent query on the R-sig-phylo email list got me wondering if there was any reason that the code from my recent major rewrite of read.simmap couldn't be harvested to re-write read.newick as a "robust" tree reader that can accept singleton nodes, etc. has two singletons - one on the edge leading from the common ancestor of A & B to tip A, and another below the clade containing A, B, C, and D.
read.newick() and it is getting stuck. And you can see it running but never ending. Since I can't see any error, do you have any idea of what is happening? Thanks! This looks like a nexus format tree with singletons. read.newick handles singletons, but only in plain Newick (i.e., phylip) format. Is that correct? Looking through the file it seems very standard, so I cannot spot a problem with the tree. Mesquite didn't have issues with it so I'll guess a I'll save it in a different format? Hello Liam, I encountered the same problem as Rosana did. Did you figure out the problem? It would be very helpful if you share the explanation/solution! Thanks for the script! I helped deal with all of the Picante R issues with my tree with lots of singleton nodes (common issue if working with tropical forest data). I can finally run the various phylodiversity metrics. Yay. Hi Liam--I just wanted to shake your virtual hand for the incredible help your scripts have been. No reply necessary. NA/NaN/Inf in foreign function call (arg 6)"
Not sure what I am doing wrong because I have run this script before on other trees and I had no problem at all. Any help would be very welcome! If you send me your tree file I can try & troubleshoot - otherwise it's hard to say as I do not recognize that error message. I am trying to reproduce this with my own newick file but it gets rejected everytime, and r does not visualize the problem. The file is pretty big so I dont know were to start. Is there a way of easily checking your phylofile? Sorry I am very new to this. Did you first try to read it in with read.tree from the ape package? read.newick is not intended to replace read.tree, it just may be able to read trees that are badly conformed in some way that cannot be read by read.tree. If, in fact, you need to use read.newick - you could check to see if the root edge has a branch length or node label. Search for ";" and remove everything between the laste ")" and the ";". Let us know if that works. But with read.tree function i still get an error. Even when i delete the parts you reccomended. I don't recognize that error message. You are welcome to try emailing me your tree file. Alternatively, you might post your question to the R-sig-phylo email list. really I tried, but it did not work. May I send you my tree? Yes. Send me your file & R code and I will try to reproduce your error. Thanks Liam! I needed that! I am trying to add the following species phylogram that I can open using Dendrocope tree viewer software without any problem, as the column dendrogram, to a heatmap I am trying to build using heatmap.2. And using read.newick, I can read it in, but when I collapse single nodes, the tree plot looks nothing like the original I see with Dendroscope. Is there a problem with my tree? Or in its format? Since it is a species phylogram, there are no branch lengths. 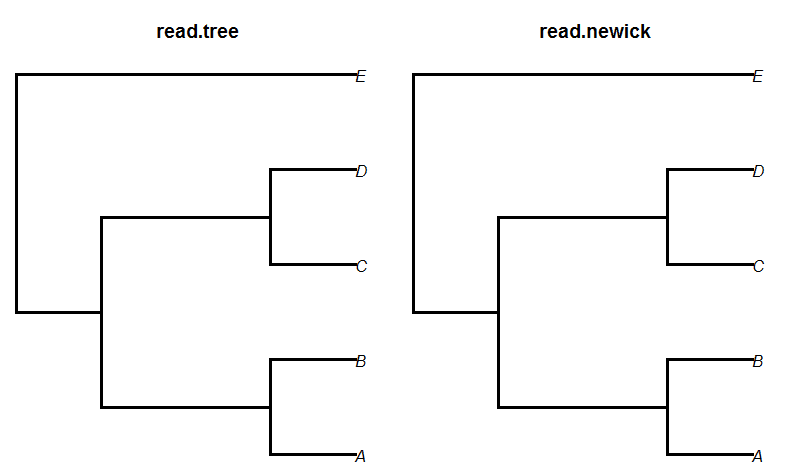 I tried the functions read.tree and read.newick to open a phylogenetic tree of birds. With read.tree I got the typical error (Error in if (sum(obj[[i]]$edge[, 1] == ROOT) == 1 && dim(obj[[i]]$edge) > : missing value where TRUE/FALSE needed), but when I used read.newick it took really long I let it run 24h and I stil didn't get the tree. Do you know any other function that will work with a complex tree? I was trying for hours to read a tree generated by "phyloT" website. Thanks Liam from down the road in Amherst! Glad to hear it. I'm here to serve!